In The Ho Chi Minh Guerilla Warfare Handbook: A Strategic Guide for Innovation Management, just released by Dandelion Books, author David Yurth, a scientist, inventor, writer and entrepreneur, claims that we already have the technologies and means for solving all of the major problems confronting Planet Earth in the 21st century. Yurth's remediation list includes: converting sea water to fresh water without burning fuels or creating pollution; providing virtually infinite power without burning any fuels at all; erasing CO2 as an exhaust gas at the source; remediating radioactive emissions from spent nuclear fuels; eliminating virally-caused cancers and other biocidic pathogens without surgery; radiation or pharmaceutical interventions; and growing organic, non-GMO food without the use of herbicides, pesticides or synthetic fertilizers. “So if we know how to solve these problems,” asks Yurth rhetorically, “why haven’t we done it? What stands between the problem and the solution?" According to Yurth, "The right to control global social, economic and political engineering is the battlefield on which today’s most important wars are being fought. Powerful private interests are still holding the world hostage to strategic energy supplies. In The Ho Chi Minh Guerilla Warfare Handbook, Yurth distills North Vietnamese leader Ho Chi Minh’s strategic thinking and tactical execution into a set of concepts used in the 1960s to drive both the colonial armies of the French and the invading forces of America and its allies out of Vietnam. Yurth believes these guerilla concepts are universally applicable to the process of 21st century technological innovation. “The Ho Chi Minh Guerilla Warfare Handbook is a long overdue strategic masterpiece from David Yurth empowering regular folks on the ‘how to’ of guerilla marketing—a step by step action plan that works,” states Jerry Pulley, Sr. VP, Product Development, Proctor & Gamble (Ret.). 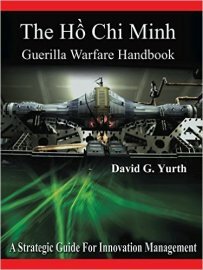 “Yurth's brilliant and laser focused mind combined with his unique perceptual insights make The Ho Chi Minh Guerilla Warfare Handbook a valuable, hands-on guide to strategic thinking about management, business and life," says Ray Zimmerman, Veteran Film Producer & Former Sr. VP, Sony Pictures Entertainment. The Ho Chi Minh Guerilla Warfare Handbook, published by Dandelion Books, is available globally in both hard copy and eBook formats in all online and brick & mortar bookstores. David Yurth interviews pertaining to innovative technologies are a free download at dandelionbookscloud.com. My professional focus for 50 years has been in the field of technology development, invention management, and system integration. I have served as chief scientist, managing partner, founder, director, and CEO of numerous companies. I am currently working as Director of Science & Technology for the Nova Institute of Technology. My experience is heavily weighted in industry networking, technology analytics and research, and prototype development and testing. I have invented or co-invented a number of innovative technology-based integrations including the X Chip Program Content Filter, Guayule Rubber Latex Commercialization Process, Dialog Language Replacement System, PageTurn computer display system, Collective Ion Accelerator System [for treating radioactive nuclear waste], Electronically Shaded Glass, FloatFisher personal watercraft, SREV [Self-Recharging Electric Vehicle], V-Car Personal Aerial Vehicle, Low Temperature Phase-Change Fluid Power Generating System, Solid State Thorium Nuclear Reactor, Ionic Liquid Solvent Extraction of Petroleum From Tar Sands; Plasma Induction Amplification Systems; Plasma Emission Fuel Ignition Systems; Corona Discharge Plasma Gas Dissociation System; DynoPlug® Plasma Ignition Device; and, Zut!® Fair Trade Print-on-Demand Point-of-Sale System. I am the author of twelve books, 15 screen plays and 12 scientific papers, articles and scientific monographs. I serve as a scientific peer reviewer and editor for 5 peer-reviewed scientific publications. I currently serve as Director of Science & Technology for the Nova Institute of Technology and as a consultant-project manager for several independently-owned prototype development groups in the United States, EEU, Australia and Ecuador. I play the guitar, 5-string banjo, and electric bass. I am a singer-songwriter, and perform occasionally by myself or with others. I am married and live with my wife Claudine and our seven cats in Holladay, Utah.